Can you identify the woman and baby in this photograph? A black and white negative of an unidentified woman and baby. In this view the woman is holding a baby and has her back to the photographer. The baby is looking over the woman's shoulder at the photographer. 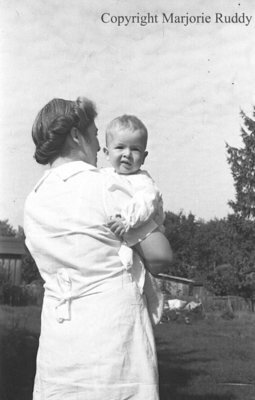 Unidentified Woman and Child, c.1945, Marjorie Ruddy. Whitby Archives, A2013_040_840A.